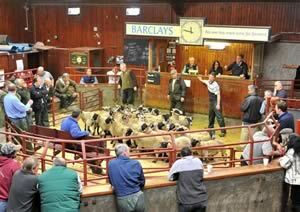 The Cumberland & Dumfriesshire Farmers Mart PLC had forward 64 prime cattle, 34 over thirty month cattle, 4,449 prime lambs and 6,445 cast ewes & rams at their weekly sale at Longtown on Thursday 16th September, 2010. Prime cattle were easier on the week with a top price of 166.5p for a Limousin heifer from A. Irving, Toppin Castle, others 163.5p Toppin Castle and Wyseby Hill, 159.5p Newby Farm and Toppin Castle; Charolais 161.5p, 151.5p Hallburn, 151.5p Sceughdyke. Bullocks to 156.5p for British Blue from Houghton House; Limousin 153.5p Wyseby Hill Cottage and Slealands, 152.5p Dashwellgreen. An increased number of 34 OTM’S saw trade sharper for a better show of beef cows. Top price of 124.5p for a Limousin cow from A. & B. Scott, Dinley, others 113.5p Blindhillbush, 109.5p Wyseby Hill Cottage, 107.5p Dinley and Wyseby Hill Cottage; Charolais 105.5p, 103.5p Blindhillbush; British Blue 105.5p Blindhillbush, 97.5p Cadgillhead. Limousin steers to 123.5p Burnside. A smaller show of prime lambs was forward to the usual ring of buyers, with a shortage of supply ensuring trade sharper on the week and one of the best saw this week, overall average of 163p per kilo. Top per kilo of 193p for Texels from Hermitage and to £100 per head for Texels from Kirkton, others £93.80 and £87.80 from the same home; Beltex £80.20, £75.80 Sorbie; Charollais £80 The Kerr, £77.80 Lanerton; Suffolk £78.80 Sykehead, £77.80 Sceughdyke and Becton Hall; Hill Cheviot £76.50 Old Hall Farm, £67.80 Terrona; Cheviot Mule £74.80 Snowgreen, £63.20 Archerbeck; Greyface £72.50 Slealands, £72.20 The Side, £71.80 Greensburn; Half Bred £72.20 Whiteknowe; Blackface £70, £67.80, £67.20 Bowershield, £65.80 Chapel House; Lonk £66.20 Bush of Ewes; Shropshire £61.80 Golden Lane; Zwartbles £60 Stanley House; Lleyn £59.80 South Bowerhouses; Swaledale £58.50, £53.80 East Unthank. The 1,220 light lambs sold to £58.80 for Suffolks from Haggistone Holm; Texel £58.20 Tarnside and Craig Farm; Blackface £57.80, £54.20 Colte Coates; Lonk £56.80 Bush of Ewes; Greyface £55.20 Crossibeg; Hill Cheviot £55.20 Unthank, £54.20 Mount Benger; Swaledale £48.80 Low Rough Hill. A larger show of 6,445 ewes was forward with fewer buyers present, although trade remained steady all classes would be £2 to £4 easier on the week, especially hill ewes. Top price of £124.50 for Texel tups from Coytre, others £118.50 Haithwaite, £106.50 Roadside; Leicester £108.50 East Unthank; North Country Cheviot £102.50 Winterhope; Hill Cheviot £96.50 Sorbietrees and Blackwoodridge House, £88.50 Todrig; Suffolk £93.50 Burnstones and Winterhope, £86.50 Dale End Cottage; Ryeland £90.50 Broynach; Blackface £68.50 Peela Hill; Swaledale £36.50 Whitton. Heavy ewes to £120.50 for Texels from Snowgreen, others £117.50 Roadside, £114.50 Oldfield; Suffolk £98.50 Marygate, £95.50 Severs and Roadside, £92.50 Severs; Leicester £92.50 Floors, £90.50 Knells; North Country Cheviot £92.50 Oldfield, £90.50 Bardnaclaven, £80.50 North Synton; Charollais £92.50, £84.50 Roadside; Greyface £80.50 Barend Farm and Newbigging, £74.50 Burnstones, Old Hall and Pitogarty; Cheviot Mule £79.50 Thuster Mains, £72.50 Heithat; Half Bred £77.50 Burnfoot on Esk. Hill ewes to £78.50 for Cheviots from Barnglies, £68.50 Twislehope, £67.50 Floors; Blackface £61.50, £60.50 Albierigg, £59.50 East Farm, £58.50 Shitlington Hall; Kendal Rough £58.50 Churchview; Shetland £58.50 Broynach; Lleyn £56.50 Whinfield, £48.50 Shaw Cottge; Swaledale £47.50 Dale End, £43.50 Woodside, £42.50 Sweetshawhead; Jacob £49.50 West Farm; Herdwick £43.50 Laal Steins, £35.50 Common House. Goats to £58.50 Morton Farm.